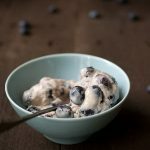 This blueberry buttermilk ice cream is sweet, rich and creamy with a touch of sourness from the buttermilk. 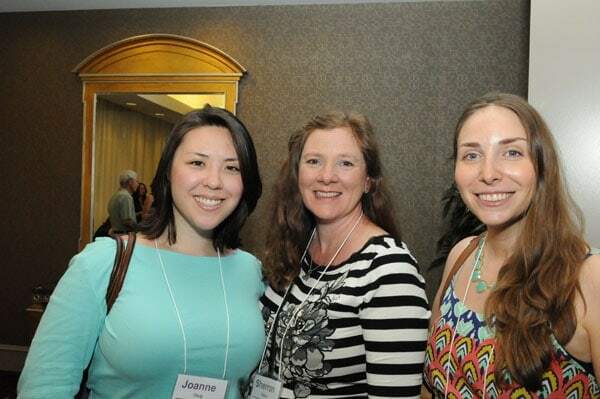 I attended Eat Write Retreat last weekend and it was a joy to meet so many food blogger friends in person. The workshops were incredibly informative as always and every detail was thoughtfully planned out. Last year, Eat Write Retreat was my first conference and it set the bar very high for every conference I’ve attended ever since. I made great connections and gained new insight into the world of food blogging. As with my recent post about last week’s California Strawberries Farm & Culinary Tour, I feel like I could easily write a novel trying to rehash all of the fun details from the event. I’ll try to summarize some of the most memorable moments for me without going on too long. If you’re just here for the recipe, feel free to scroll to the bottom! My travel buddy was Sherron from Simply Gourmet. I love this gal! She’s fascinating to talk to and the car ride was never boring. 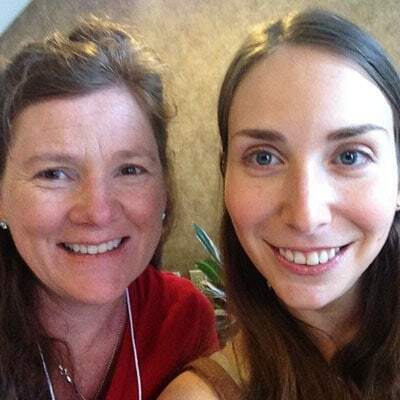 Please go visit her awesome blog, especially if you’re gluten free! As soon as we arrived we got to meet Joanne from Fifteen Spatulas. Another incredible blog worth checking out. One thing I love about this conference is that it encourages everyone to mingle and network. Upon arrival at the event we were all given the name of a seemingly random dessert (mine was dark chocolate cake). When we arrived at dinner it was revealed that these were the names of the tables at which we would be sitting for our meal. Each table had a tiered stand containing miniature versions of our dessert. I was lucky enough to enjoy dinner with many cool people including Veronica from OXO. I love working with OXO and they’re always a big supporter of these conferences. 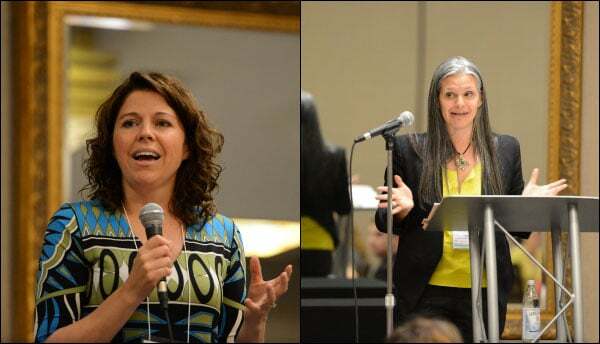 Our two fearless leaders in action, Casey Benedict and Robyn Webb. 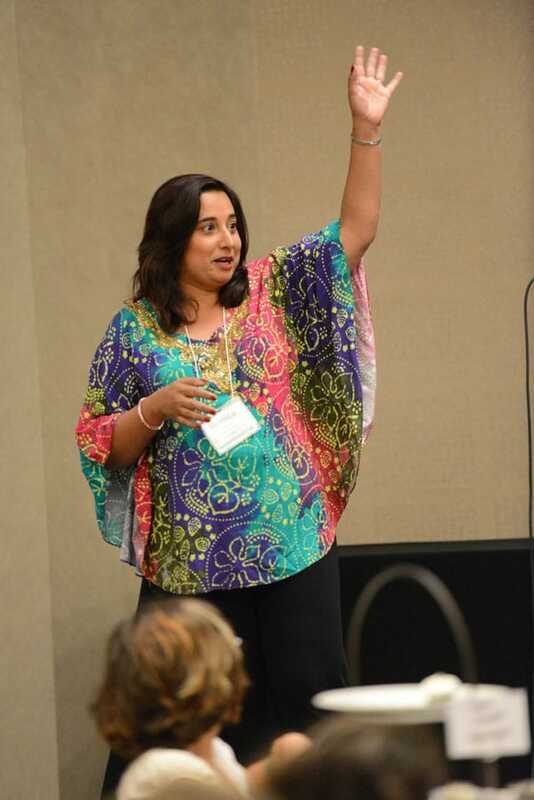 Keynote speaker, the always inspiring Monica Bhide. I just started her food writing workshop! 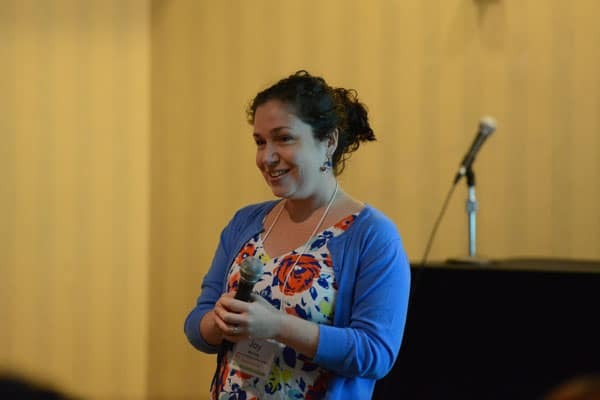 One of my favorite workshops was all about networking. Joy Manning was fascinating to listen to and I really learned a lot from her. One of the best tips she offered was an obvious one but it’s so important to keep in mind. Be nice. Always. You never know when you’re going to suddenly reconnect with someone down the road under any number of circumstances. I also really loved listening to Carolyn from All Day I dream About Food, Valerie from Feastie and Jesse from Simply Recipes as they discussed some of the more complicated technical details behind blogging. SEO, Google Analytics and site optimization are all areas I’m trying to improve on. Two tips that really stood out: always customize title tags in blog posts and save Photoshop files at 60% as opposed to 80% (different, better technology at 60%). Unfortunately I wasn’t able to stay for the final day of the conference but I don’t feel like I was deprived at all. The 2 days that I spent in Philadelphia were exciting and useful. I can’t wait to go back next year! The recipe includes optional powdered buttermilk, which is a new favorite ingredient of mine. It did wonders for my buttermilk ranch french fries and I believe it can be used to add a lot of flavor to any buttermilk recipes in addition to regular buttermilk. This may sound weird but I really enjoy the sour taste of buttermilk. Not by itself, but IN recipes. And I’m often disappointed when it completely fades into the background of a recipe. If you whisk just a small amount of this powder into any standard buttermilk recipe, it brings back some of that sourness in a mild way and helps to balance out the other flavors. I recommend it but it’s optional. I’ve seen it at many grocery stores and it’s also available online. 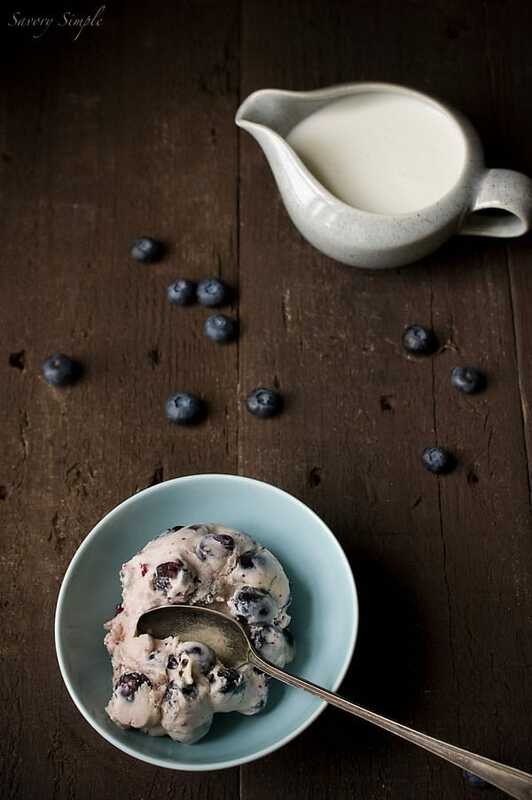 It’s important to cook the blueberries before adding them to the ice cream base. If you don’t, you’ll wind up with frozen berries and those aren’t very fun to eat. The more you cook them, the more they’ll soften and release juices. You can even cook them down to a puree, which will result in a very different looking ice cream from what you see in these photos. 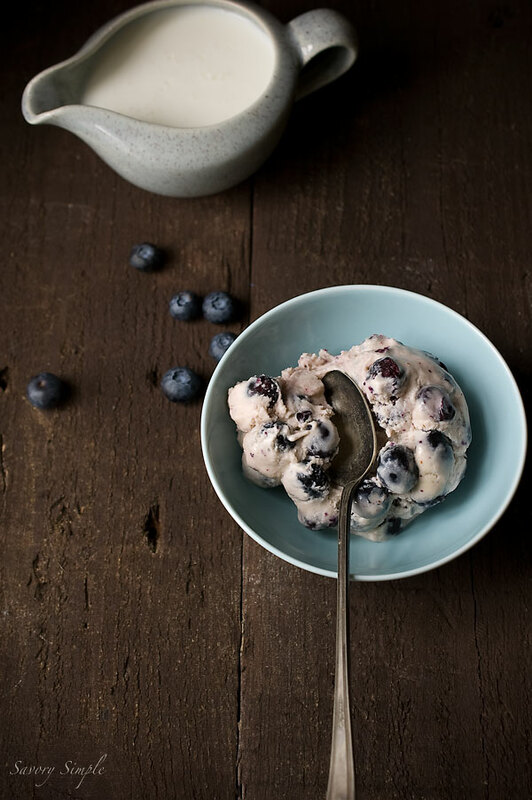 I’ve made several batches of this ice cream now and in all honesty, the version you see in these photos contains blueberries that I didn’t cook quite long enough. More cooking = better ice cream. In a small saucepan with a splash of water, heat the blueberries over medium-low heat, stirring frequently. They will begin to turn a deeper blue and release liquid. Continue stirring and cooking under the blueberries are very soft or a complete puree, depending on how much texture you like. You can also puree them completely after they have cooled. Heat the heavy cream and vanilla extract on medium heat in a medium saucepan. While the cream is heating, whisk the egg yolks and sugar together. Once the cream is simmering, slowly pour it into the egg yolks and sugar while whisking. Pour the mixture back into the saucepan and turn the heat down to medium low. Stir in a figure 8 motion for several minutes until the ice cream base is thick enough to coat the back of a wooden spoon. Remove from the heat and stir in the buttermilk. If using, whisk the powdered buttermilk into a small amount of the liquid and then incorporate it into the ice cream base. Stir in the cooked blueberries. Allow to chill completely in the refrigerator. Prepare in an ice cream machine according to manufacturer's instructions. I’m so glad we got to hang out a bunch!! This ice cream looks absolutely killer. I just bought some blueberries today…tempted to go back out and get some buttermilk! The conference sounds like a lot of fun and very informative. And this ice cream. Forget about cereal or granola, I want this for breakfast! Awesome recap of the conference! I’ve never been to one, but it’s always fun to read bloggers report afterwards (and thanks for writing in details!). I haven’t made ice cream with blueberries this year. Your ice cream looks so delicious, Jen! 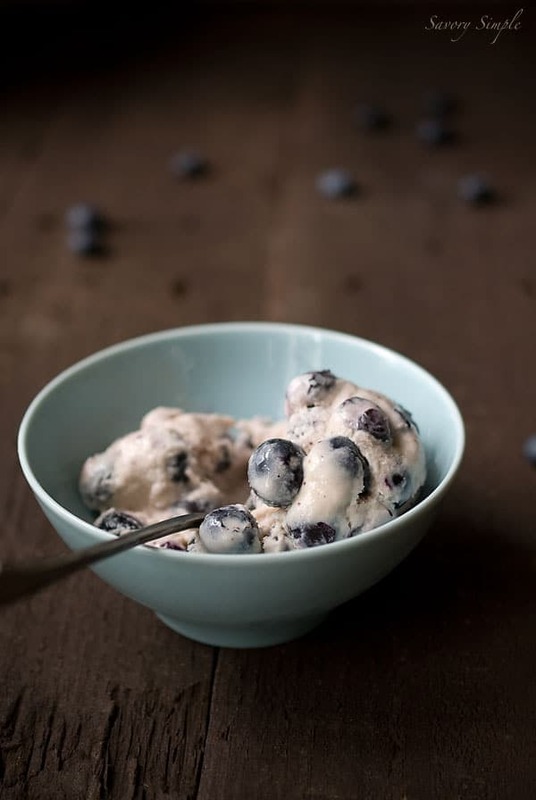 This looks really good.I’ve never heard of blueberry ice cream before.I like how the blueberries are combined with buttermilk.I’m definitely going to try and make this sometime.